The Boxing 101 series of articles is designed to provide some instruction and explanation to beginner boxers who are interested in learning the fundamentals. While the information covered may be basic, it is also a good refresher for those with more advanced skills. As any boxer can tell you, each gym and each coach often have their own unique perspective on what constitutes proper technique and what does not. I am not going to change that reality, nor am I going to proclaim that any viewpoint is superior – but I do think it is worth while to survey some of the differing views out there – to find similarities, gain some technical insight and do some critical thinking about what some boxers currently do, and how they might perform better. 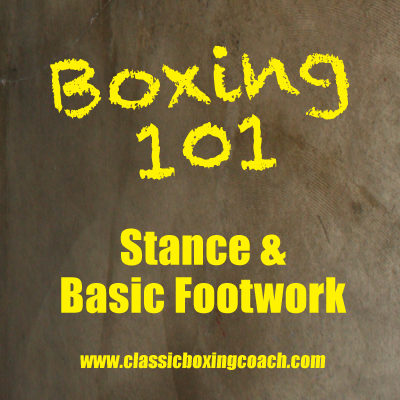 This first edition will cover the proper boxing stance and footwork basics. Why start here? Well, if you don’t have the proper stance and footwork, it seems fairly obvious that you are going to encounter problems down the road. Without the correct boxing stance, your ability as a boxer will be limited. You may lose your balance or have trouble developing power or you may simply feel sluggish or clumsy. 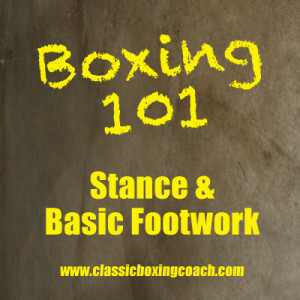 This is because the ability to punch with power and the ability to move swiftly and efficiently depend on mastering the fundamentals of footwork. In addition, stance and footwork are almost always overlooked. Excited by the chance to start throwing some punches, many people neglect to train their feet and head straight for the heavy bag. But, if you dedicate some time each training session to improving your stance and drilling footwork technique, you stand a much better chance of progressing. The following videos are widely available on the web and there are many other similar videos out there. I chose these simply to provide a starting point and because they obviously cover this articles topic. In this video, Rus Anbar – a boxing trainer and analyst – makes some good points. The head should not be in front of the lead foot. If it is, then presumably you are either leaning too far forward and have too much weight on your front leg or perhaps you are standing too tall because your stance is too narrow. The lead leg should be “firm, but without being locked”. Most people would just say “keep your knees bent,” however I find Mr. Anbar’s description more useful because it emphasizes the extent to which you bend your lead leg. After all, if you bend your front leg too much, you will end up with too much of your weight leaning forward and your head over your front foot. The back heel should be up, i.e. not resting on the ground. Again, most people would simply say “stay on your toes.” Technically speaking – your weight should be on the ball of your foot – not your toes. Regardless, resting that heel on the ground is a very common beginner mistake, especially when a boxer has tired legs, and can have dire consequences on the ability to throw right crosses and remain mobile. In this classic video, Don Familton explains his views for Straight Blast Gym. First, he reminds us to keep our knees bent or slightly flexed. Regarding foot position, he states that the “right toe [should be] on a parallel with the left heel.” If I understand correctly, this seems as if it would put the feet fairly close together and so I question whether this is truly what he intended to convey. Even if the feet had some lateral distance between them, it would be too square for my taste. The boxer’s weight should be slightly forward, which should allow you to lift your rear heel off the ground as Mr. Anbar suggested. However, you should not allow your head to move too far forward, which is why Mr. Familton recommends leaning forward only approximately 5 (five) degrees. Regarding the position of the upper body, Mr. Familton explains that, as you pitch your body slightly forward, the chin should be down. This protects the most vulnerable part of your head (the chin) and changes the angle of your face so that any connecting blows we be better deflected. Of course, your hands should be up and within proximity to your face so tuck your elbows in toward your hips, with your left hand just off your left shoulder and your right hand off of your chin. Mr. Familton also touches on the importance of having a good stance and the purpose of good footwork – the efficient and balanced transfer of weight. This topic will be discussed more fully in future Boxing 101 articles but it’s fitting to have a bit of a preview here. That being said, I have to warn that Mr. Familton’s 1-2-3-Punch drill could lead to developing some bad habits that could cause a boxer to be easily timed and counter-punched. Thus, once you understand how to transfer your weight, you should abandon this drill for one that does not telegraph your intentions. Back to Mr. Anbar. While he doesn’t say it explicitly, the big message here is “don’t ever cross your feet.” Always move the lead foot in the direction you want to go first, then drag the trailing foot to pick up the slack and to return to your stance. Maintaining a rhythm when moving will help you stay balanced and on the balls of your feet. Freddie Roach needs no introduction. He’s trained scores of fighters including numerous champions. He knows what he’s talking about. Mr. Roach instructs that we ought to keep some lateral space between our feet (two inches or so) but also says that a fine line exists between having too little and not enough space. Let balance be your guide. If you have trouble maintaining your balance laterally, your feet are likely too narrow. Try and widen your stance slightly without allowing your shoulders to square up. Another great tip is to avoid getting square when moving side to side – keep that lead leg forward! Mr. Roach also talks about how to line up against your opponent. “On line” as he calls it, is when your lead foot is lined up such that it points directly in between your opponent’s feet. That’s it for this edition of Boxing 101. Send us your comments, especially if you have suggested Boxing 101 topics. Obviously, stay tuned for future episodes and no matter what else – keep your and hands up and chin down! Classic Boxing Coach offers individualized boxing workouts and boxing training programs for beginners, competing amateur boxers, professionals, and boxing enthusiasts looking to use boxing as a means to get in shape and improve fitness levels. For more information on Classic Boxing Coach’s boxing programs, boxing fitness or boxing training in Orange County, visit the programs page or contact us by phone at (949) 354-BOXR (2697) or by email.